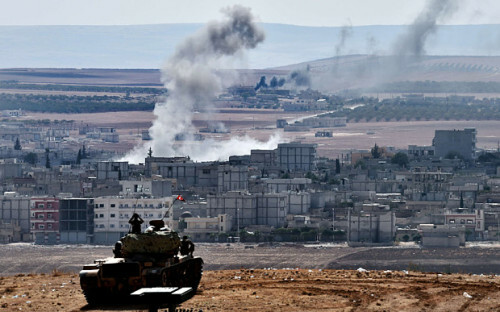 Syria Daily, Oct 10: Will US & Turkey Agree on a Strategy Over Kobane — and Beyond? UPDATE 1600 GMT: The US has again indicated that it is prepared to accept an Islamic State takeover of Kobane. I don’t know what’s going to happen because again in the absence of any ground force there, it is going to be difficult just through air power to prevent [Isis] from potentially taking over the town. Meanwhile, the UN envoy for Syria, Steffan da Mistura, said about 500 to 700 elderly people and other civilians are still trapped in Kobane, with 10,000 to 13,000 are stuck in a nearby area on the Syrian side of the border with Turkey. Da Mistura appealed to Turkish authorities “to allow the flow of volunteers at least, and their equipment to be able to enter the city to contribute to a self-defence operation”, and then indicated that they should send in ground forces “to support the deterrent actions of the coalition through whatever means from their own territory”. I spoke again to #Kobane chief Anwar Moselm who is in city. "If we dont get help now, #Kobane is indeed under threat of falling to ISIS"
General John Allen, President Obama’s envoy in the campaign in Iraq and Syria against the Islamic State, has begun critical meetings in Ankara with Turkish officials. The discussions on Thursday and Friday have been spurred by the Islamic State’s offensive on Kobane, the Kurdish center in northern Syria on the Turkish border, and by Turkey’s proposals for military intervention with “safe havens” and use of its bases by foreign forces — provided the aim of removing the Assad regime is included with operations against the Islamic State. Rather than accept the proposals, US officials have been preparing to blame Turkey for the fall of Kobane. Through leaks to the media, they have derided Ankara for not sending ground forces into the Kobane area — even though Syria’s Kurds have said they will only accept Turkish troops as part of an international force — and dismissed the idea of the buffer zone, let alone support of Syrian insurgents to face regime forces. Little information was released about Thursday’s discussions, but the initial signs are not positive. State Department spokeswoman Jen Psaki put out the ritual statement that Allen, accompanied by senior Department official Brett H. McGurk, “emphasized that urgent steps are immediately required to degrade the Islamic State’s military capabilities and ongoing ability to threaten the region”. Psaki added that the Americans stressed that strengthening the “moderate” Syrian opposition “is crucial to any realistic and lasting political settlement of the Syrian crisis”. Ankara pressed its initiative as Allen arrived, asking NATO to put the issues of safe havens and no-fly zones on its agenda. Foreign Minister Mevlüt Çavuşoğlu put the request to the new NATO Secretary-General, Jens Stoltenberg. The reluctance of Turkey’s president, Recep Tayyip Erdogan, to do more to fight the militants has exasperated many American officials, who see Turkish tanks positioned on their side of the border, while Kobani, a Syrian Kurdish city, faces a massacre if American-led airstrikes fail to stall a militant offensive. The Islamist faction Jabhat al-Nusra claims that a Lebanese soldier has defected to it. Insurgents have repelled another regime ground offensive on the key town of Morek, on the main highway from Hama to Aleppo. Syrian forces attacked and briefly occupied a former tank battalion base, but it was soon recaptured by insurgents soon after. Meanwhile, insurgents, led by the faction Ahrar as-Sham, have claimed villages elsewhere along the Hama-to-Aleppo route. The advance threatens to cut off supplies to regime forces in Aleppo city, divided since July 2012. See Syria Daily, Oct 9: “Safe Havens” Inside the Country? We reached out to the Kurds and we became friends….The [Kurdish militia] YPG were fighting Daesh [the Islamic State], so we were forced into an alliance with the YPG. We had nowhere else to go. Daesh were surrounding us on all sides, except of course behind us was the YPG. As the Arabic proverb goes, “the enemy of my enemy is my friend”. A regime airstrike on a market in the Damascus suburb of Erbeen killed more than 20 people on Thursday.